Cinque Terre is a new Italian restaurant that's comfortably old-school, but surprisingly refreshing at the same time. The space is opulent and the dining-room staff knows exactly what it's doing. 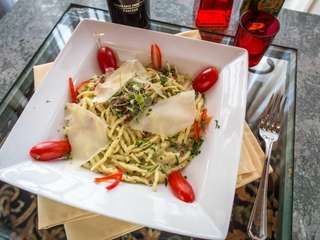 The Italian fare is respectable and satisfying, a main reason to pay this spot another visit. Open Tuesday to Thursday, noon to 10 p.m.; Friday, noon to 11 p.m.; Saturday, 1 to 11 p.m.; Sunday, 1 to 9 p.m. Closed Monday. If the trend del giorno and the flavor del momento pester and peeve you, go retro at Cinque Terre. The new Italian restaurant is comfortably old-school, but surprisingly refreshing at the same time. There's no balsamic flood, all the seafood is cooked and the smooth dining-room staff knows exactly what it's doing. Cinque Terre succeeds short-lived Amicale and much-missed Panama Hatties at this address. The opulent, sometimes overdone look remains. Big chandeliers abound. The fireplace boasts ornate molding and marble. And the coffered ceiling includes a panel devoted to the Sistine Chapel's. Color photos of the Cinque Terre, the five towns along the stirring, dramatic coastline from La Spezia to Levanto, cool things down. 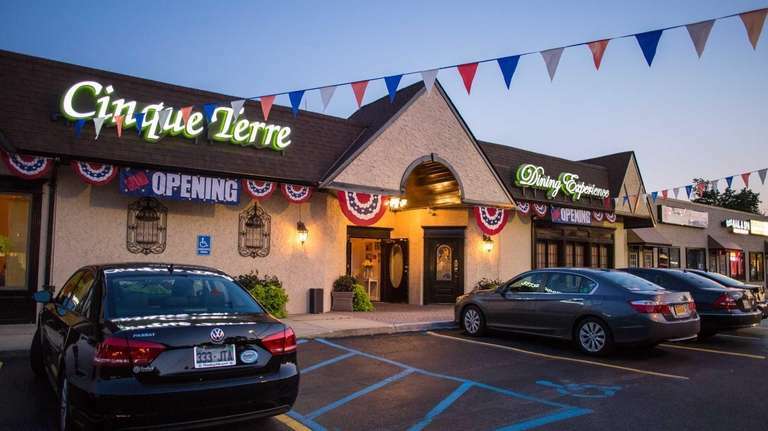 Chef and co-owner Anthony Page and co-owner Pam Page also run the modest Verona in Farmingdale. That has about as much to do with Romeo and Juliet's scene as this does with the Ligurian shore. But the approach is so openhanded and eager to please that they could get away with calling it L'inferno. Sip a breezy Italian white from the respectable list, daydream about the Riviera and enjoy the smoky, pan-seared sardines; citrus-dressed braised octopus; and especially the gilded fresh fritto misto of shrimp, squid, cuttlefish and red snapper. Try the tightly wound trofie pasta, sauteed with a roasted tomato puree and some pesto for a hint of Genoa. Or just dive into the very good, amplified spin on pappardelle Bolognese, wide ribbons of pasta in a tasty, meaty ragú that adds peas and a crown of ricotta. Spur your appetite with bow-shaped farfalle tossed with eggplant, sun-dried tomatoes, capers, basil, olives and white anchovies. A special of meat-filled tortilli could prepare you for autumn. Risotto with Gorgonzola, spinach and tomato has a lot going on, but it's creamy and satisfying. Branzino, fast becoming the tilapia of a new generation, arrives pan-seared and polite, with sauteed mushrooms, truffle sauce and salad. Maybe it's seen as a contemporary touch. Oven-roasted red snapper is a bit overcooked, but has more taste, with tomato puree, olives and caramelized onions. The slightly dry, double-cut pork chop overdoes it with cipollini onions, Brussels sprouts, pancetta and a Chianti-fueled demi-glace. Chicken scarpariello delivers just enough peppery heat with the tender bird and sausages. A side of broccoli rabe is pretty stemmy; escarole and beans, a little al dente. Cinque Terre's better sweets are a professional chocolate mousse, crème brûlée and, of course, Italian cheesecake. No foam in sight -- except on a cappuccino.